Without microorganisms humans would not be able to survive. Especially our gut flora is an extremely densely populated ecosystem that houses billions of bacteria which help us to digest or detoxify food, supply us with vitamins, or modulate our immune system. Similarly, plants have also a so-called microbiome. In contrast to animals and humans, microorganisms associated with plants are primarily soil microbiota. Scientists consider the soil microbiome as a kind or external plant immune system. However, due to the enormous complexity of these microbiomes it is very difficult for scientists to group bacteria as beneficial or deleterious, and some bacterial taxa are even able to morph from Dr. Jekyll into Mr. Hyde upon environmental stresses. A team of scientists led by Ian T. Baldwin is investigating the microbiome of the wild tobacco species Nicotiana attenuata. "In order to manipulate the microbiome, we used the expression of antimicrobial peptides. Our plants showed activity against different Bacillus species, which are mainly known as plant beneficial microbes. We assumed that that these transgenic plants might show deficits in growth or reproduction in field experiments. In other words: we wanted to make an unhappy plant to see how important microbes are for them. To our surprise, the plants appeared rather unimpressed when we compared them with controls in the field," first author Arne Weinhold summarizes. However, a closer look and the results of further experiments indicate that different strains of the same bacterial species differ in sensitivity against antimicrobial peptides. Current methods used to characterize the microbiome fail to recognize these differences. The scientists believe that the antimicrobial peptides target single strains. Yet, the enormous diversity of bacteria in the soil provides a vast potential for new partnerships. The potential negative effects that AMP expression might have on a transgenic plant are lower than previously thought. Animals and plants produce natural antimicrobial peptides. Even in our gut, antimicrobial peptides are produced. Since most of the commensal or beneficial microbes from the human gut flora are naturally resistant to inflammation-associated antimicrobial peptides they help to keep the gut flora in balance during an inflammation. For medical purpose the agents are even considered as potential alternatives to antibiotics to fight pathogens which have become drug resistant. While antimicrobial peptides may be very potent against single bacterial strains under laboratory conditions, their effect on a whole community of bacterial strains in natural environments has rarely been evaluated and is rather questionable. "This is why it is so important to study plants not only in the greenhouse, but also under natural conditions, in the natural soils of their ancestral habitat. Laboratory experiments, in which humans control the variables that will be varied, will only provide results that are limited by the human imagination. Experiments conducted in the real world, in nature, deliver results, which sometimes challenging to interpret, are not bounded by human imagination," says the leader of the study, Ian Baldwin, who has been studying the ecological interactions of Nicotiana attenuata in nature for more than 20 years. 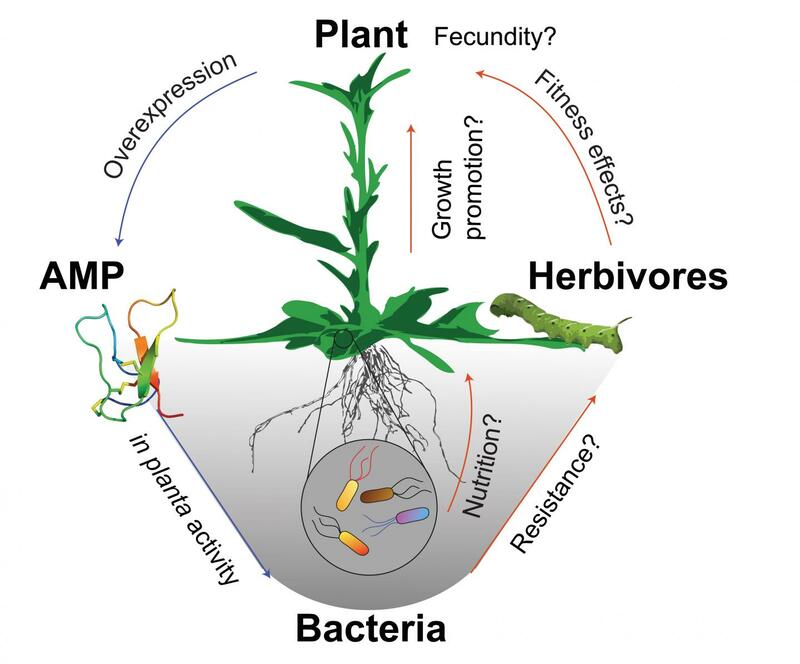 Studying the microbiome of a plant and its effects on the plant's development and the health, turns out to be much more difficult and complex than expected. The Jena researchers are now planning further experiments with tobacco plants in order to find out how these plants recruit soil bacteria, how they maintain the relationship with their bacterial partners and how they keep them from morphing into deleterious pathogens.